[He shouted, "Yo Adrian, I did it!" to Talia*] is SYLVESTER stallone, of course, playing opposite talia shore. TALIA gets a lot more play in the grid than SYLVESTER does, although he does get some share of the SLY clues. [Neat roommate*] is FELIX unger. [___ Mourning (longtime Miami Heat center)*] is ALONZO, because ZO wasn't long enough. he's been a favorite of mine since his georgetown days. [Uncomfortable, as some blankets*] is SCRATCHY. yes! and some sweaters. crossing the other five and running across the grid's center is [One's own odyssey through life*], or PERSONAL JOURNEY. so what's going on here? well, the instructions tell us that This week's contest answer is an unnerving event that occurs five times in this puzzle. what's the unnerving event? well, the first five starred answers (the ones that read down) are all the names of cats, real or fictional: SYLVESTER from looney tunes; FELIX the cat of silent films; ALONZO ... i have no idea who ALONZO is (but maybe one of you can enlighten me? ); SOCKS, the former first cat of the clinton white house; and SCRATCHY of the simpsons, who's not only fictional but metafictional (i.e. he's a fictional character even in the simpsons universe). tipped off by the "unnerving event," i conjectured that they were actually all black cats, and the sixth theme answer, PERSONAL JOURNEY, intersects all of them. in one sense, therefore, you might say that all of these black cats are crossing one's path. neat, eh? neater if i had any idea who ALONZO was. [Drink brand in colorful bottles] is FUZO. i don't think i've seen this. i wanted it to be SOBE. [Dave on saxophone] is KOZ. jazz saxophonist? or some sort of late show band member? either way, no clue. [Wireless acronym] is MIMO. uh, ... no, i have no idea. something In something Out? [Healy and Merkel] are apparently UNAS. what does this mean? who's healy? are we talking about angela merkel? [Makes a tool out of] is USES. this works in either the literal or metaphorical sense. [They've been given the third degree: abbr.] are DRS, or doctors. most PhDs also have a bachelors and a masters. [If it's broken, you're soakin'] is a cochranesque clue for a DAM. [Flag-bearer, of a sort] is a football REF, who carries a yellow flag that he throws to signal a penalty. 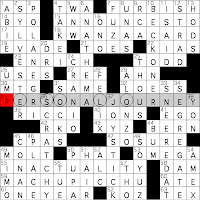 [Least common of the eight compass pts., in crosswords] is WNW. it's about 50 times less likely to show up as ENE or ESE (although not all ENEs and ESEs are clued as compass pts.). constructors often need to get some Es, Ns, and Ss into their grid; usually they're not looking for a way to squeeze in an extra W (or two). ["The barn door is open"] and XYZ are both euphemisms for "your fly is down." so far, hell month hasn't been so bad for me. how's it been treating you?